Trigger Pull: The trigger pull on the Gletcher CLT-B25 357 2.5 Inch CO2 BB Revolver is good in both single and double action, even better than the Dan Wesson and S&W 327 TRR8 shell loading revolvers, most likely because the spring tension that pushes the inner barrel to make contact with the cylinder is noticeably lighter on the KWC - Gletcher 357's. Even the hammer is smoother and has less wiggle, just a better trigger and hammer mechanism overall. Accuracy: I got a nice 2 inch 6 shot grouping on my paper target setup 30 feet away from my standard semi-rested position (sand bag up front and standing in the back). Accuracy was a bit lower than the factory claimed 320 or so fps coming in at an average of 280. I did perform my field test back in May so the weather was not all that warm perhaps effecting peek fps performance somewhat. 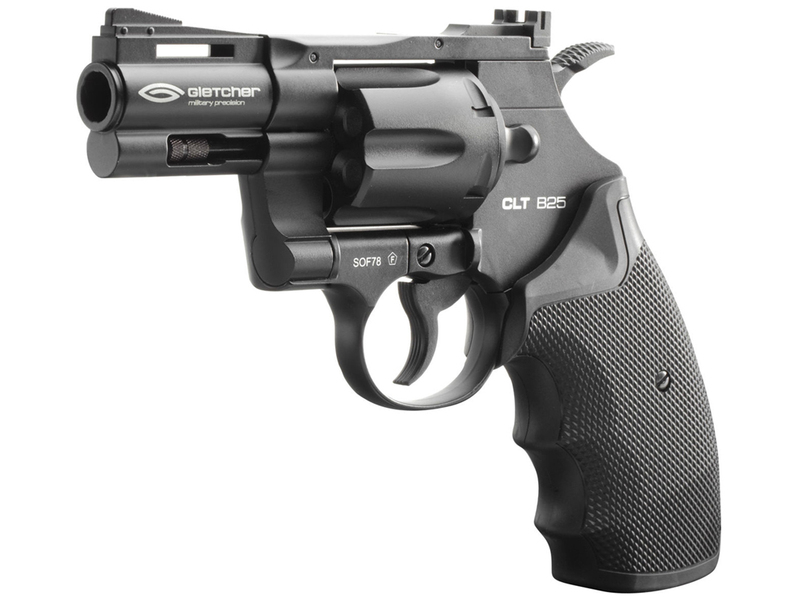 Build Quality: The Gletcher CLT-B25 357 2.5 Inch CO2 BB Revolver being mostly metal has a very good build quality, perhaps even better than the Dan Wesson and S&W 327 TRR8 shell loading revolvers, even the weight of the KWC 357 is noticeably more! The only real plastic or rubber I could find was in the grips and the shell tips. Fit and finish was also good with no noticeable wear or sloppy workmanship. Realism: The KWC - Gletcher CLT-B25 357 2.5 Inch CO2 BB Revolver overall is a close copy a the real steel 357 styled revolver. I did notice the rear portion of the receiver (between the rear cylinder and hammer) to be a bit longer perhaps to accommodate the CO2 valve length, but other than that this pistol is super close to the original 357 styled revolver it is based on. Again being all metal gives this CO2 BB revolver very realistic weight and feel and the loadable brass shells make using this gun almost exactly like using a real shell loading revolver but for much less cost per shot and of course a lot less recoil on the hands that a real 357 magnum or even when shooting 38 special shells for that matter. Lots of detail, well made, fit and finish are both good. Good overall weight, even for this short 2.5 inch barrel version. Nice trigger pull in both single and double action. Tactical fingered grips look good and allow for a firm hold. Grips are a bit rough, not as rubbery as they look. Grips may be a bit large for people with smaller hands. All black sights not great on dark backgrounds. FPS could be a bit higher! Comments: The Gletcher - KWC CLT-B25 357 2.5 Inch CO2 BB Revolver is yet another addition to the increasing lineup of shell loading revolvers available today in both Steel BB and Airsoft versions. The 2.5 inch reviewed here is meant to be the compact version with its snub nosed barrel but I would have to say it is not a small gun at all coming in at 2 pounds and with rather large grips and a pretty large cylinder to pack around. But then again, that may be just what you are looking for? The shorter barrel does effect the fps performance since longer barreled versions of this same pistol I have tested do shoot much hotter but that is to be expected with pretty much any short barreled CO2 pistol. 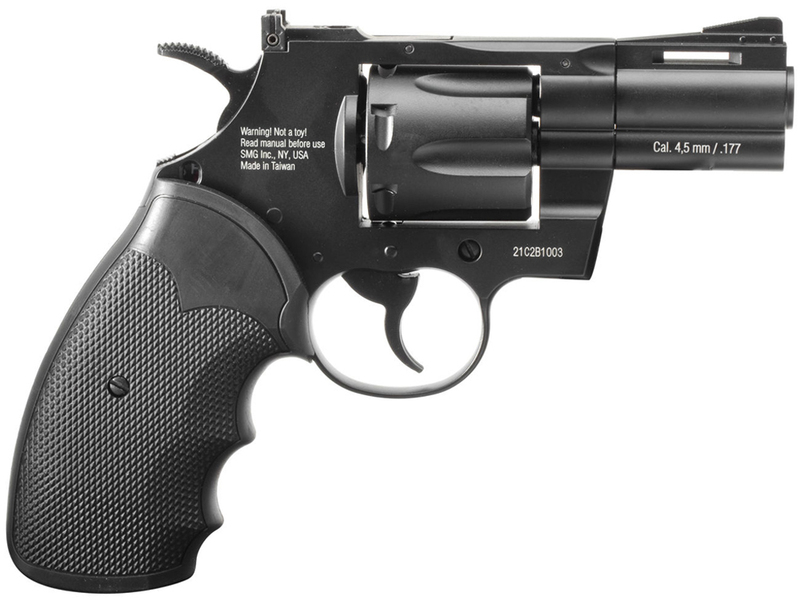 This is a table top only review of the Gletcher KWC 357 2.5 Inch Black CO2 BB Revolver. I talk specifications, show you around this BB revolver and walk you through its basic operation and handling. 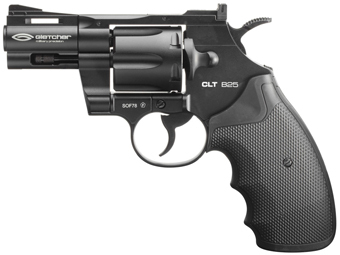 The Gletcher - KWC CLT-B25 357 2.5 Inch CO2 BB Revolver is yet another addition to the increasing lineup of shell loading revolvers available today in both Steel BB and Airsoft versions. The 2.5 inch reviewed here is meant to be the compact version with its snub nosed barrel but I would have to say it is not a small gun at all coming in at 2 pounds and with rather large grips and a pretty large cylinder to pack around. But then again, that may be just what you are looking for? The shorter barrel does effect the fps performance since longer barreled versions of this same pistol I have tested do shoot much hotter but that is to be expected with pretty much any short barrelled CO2 pistol. This is my Official Field Test Shooting Review video for the Gletcher CLT B25 CO2 BB Shell Loading Revolver. This pistol is actually made by KWC and is the same base gun that Umarex uses in their Licensed Colt Python 357 6 inch barrel version. In this Shooting video I performance various Field Tests on the Gletcher CLT B25 using my Chronograph to get a true live performance reading of the velocity in fps. I also shoot 6 rounds at a paper target positioned 30 feet from my semi-rested position (Sand bag up front and standing in the back). Velocity wise, the Gletcher CLT B25 CO2 BB Revolver shot a little low while using standard 5.1 grain zinc coated steel BB's coming in with a 5 shot average of 280 fps. the claimed the fps from Gletcher is 100 m/s which works out to 328 fps so there is room for some improvement, perhaps on a warmer day I may see these numbers? I then moved back to my 30 feet shooting position to test out the accuracy using paper target, the Gletcher CLT B25 CO2 BB Shell Loading Revolver produced n OK 6 shot grouping that was just over 2 inches in diameter. Not supper but also not too bad considering the short barrel and how tight the front and back sights are together. I'm pretty sure I can do a bit better as one of the shots did pull a bit out form the rest making the grouping larger than it could have been. 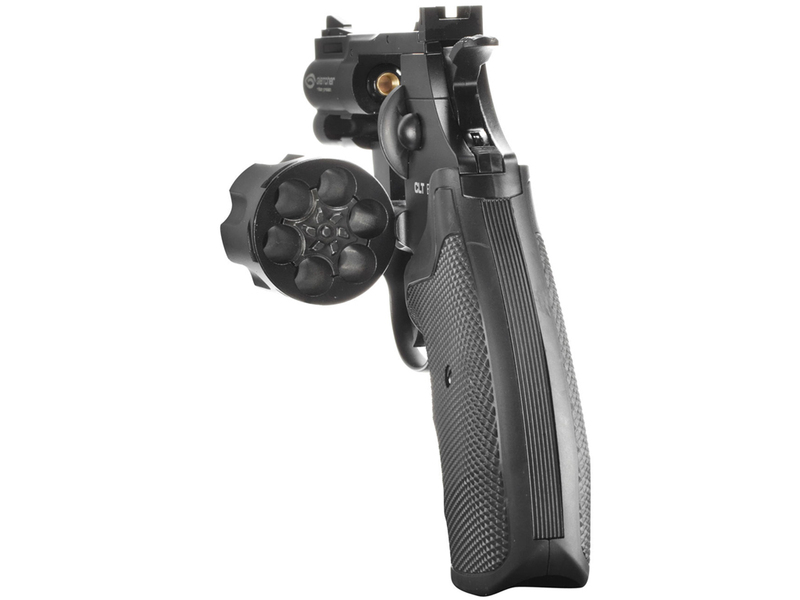 Overall, the Gletcher CLT B25 CO2 BB Revolver shot pretty has a nice feel to it when shooting, the trigger/hammer setup is nice in both single and double action, the grips and balance feels good and overall this is a very fun shell loading BB revolver to shoot.